It has been evident up to this point in time that our emphasis was on technology—the application of science—a classical function of our profession. Yet, the world was rushing headlong into the development of physical sciences, for example atomic energy and the transistor. It was high time to apply engineering science to the workings of the biological plant—the workings of the biological plant—the world’s greatest collector of the sun’s limitless energy and to coordinate technology with science. We stared with graduate and research programs, and of course science trained faculty, to complement the on-going programs of technology. F. J. Hassler, with a Ph.D. degree from Michigan State University, who joined the department in 1950, is created with developing much of the graduate programs direction with the strength; he was placed in charge of this aspect of the department’s development. Hassler had pioneered in achieving his own academic training, and guided a similar approach at this institution. The emphasis was on mathematics and the basic sciences: the best tools to equip one for work in the scientific area. 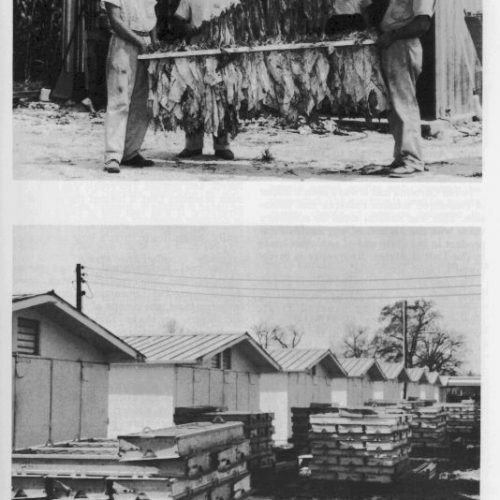 Hassler started out doing tobacco curing research at the Oxford Tobacco Research Station but was transferred to Raleigh in 1954. This move is recorded as the first real start of emphasizing the science aspects of our teaching and research program. The Master of Science program had been started in the early 50s, but needed strengthening. Additional new faculty with advanced training in mathematics and physical and biological sciences were gradually added as these kinds of positions became available. The last step in strengthening our total academic program was to provide a Ph.D. degree program for those completing the M.S.A.E. This third degree was necessary for a student in science to achieve a more complete theoretical and working knowledge in basic mathematics, physical and biological sciences. University approval, both here and at Chapel Hill, to offer the Ph.D. came in 1957. It is particularly noteworthy that this was the first Ph.D. program in Agricultural Engineering in the South and the seventh in the Nation. The first student to receive the Ph.D. degree in Agricultural Engineering was C. W. Suggs in 1959. 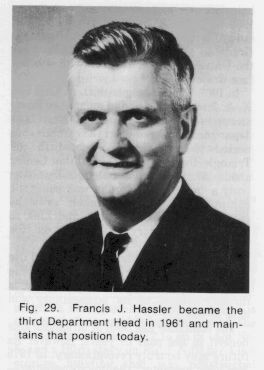 His thesis was “The Effect of Workload and Environment on Some Physiological Responses in Man.” Appropriately, the chairman of his Advisory Committee was Hassler. The Director of research for Suggs’ program (now usually called Major Professor) was W. E. Splinter, Splinter came to our faculty as Associate Professor in 1954 after receiving a Ph.D. degree in Agricultural Engineering from Michigan State University. He resigned in 1968 to become Head of the Department of Agricultural Engineering at the University of Nebraska. Suggs remained on the staff at North Carolina and has a distinguished record of research accomplishments not only in environment-work relationships but also in tobacco mechanization. See Figure 23. He had graduated with a B.S.A.E. in 1949 and spent some time in industry before returning for continuation of his academic training. Hassler has an enviable record at North Carolina. Notably he is credited with developing the method and equipment for curing flue-cured tobacco in bulk and in later years became Head of the Department. The full story of flu-cured tobacco research is quite exceptional and dramatic. Accordingly, it will be discussed later. In 1950 the late William Neal Reynolds gave N. C. State University 10,000 shares of Reynolds stock to establish 10 distinguished Professors of Agriculture. The income form these securities represents approximately $20,000 annually. Hassler was named to one of these Professorships in 1961 concurrent with his appointments as Head for the department. Only a total of 23 such awards have been made to date. The “Western Electric Fund Award” for the southwest which Bowen received in 1967 also attests to his excellence in creativity and teaching. He has chaired 11Ph.D. and 12 M.S. degree advisory committees and won several ASAE awards for scientific papers. His research covered a wide field including electrostatic dusting and environmental interactions relating to seed germination and plant growth. Figure 37B is a photo of Bowen and a machine he developed. It is called “Edathatron” meaning soil machine. It is used for studying soil-plant-weather interactions, which can not be done in the greenhouse or field. To ensure that the technological aspects of our teachings were maintained in quality and coordinated, Julian M. Fore, Professor, with a background of experience with the Tennessee Valley Authority, Michigan State University, two commercial companies and a M.S.A.E. degree from Purdue University was placed “in-charge.” He came to us from Massachusetts in 1956. One of the programs Fore supported was the education of countless numbers of North Carolinians who, for various reasons, do nor elect to pursue a four year program. Society as a whole can only be adequately served by providing a wide variety of educational opportunities. Thus a two year program was initiated in 1960 for those who desire to work in the agricultural industrial field. Such programs are organized under the Agricultural Institute of the School of Agriculture and Life Sciences. Excellence of the training offered is maintained by using the regular faculty of the four year program. Farm Equipment Sales and Services was offered by the department with the first graduates receiving a diploma of “Associate in Applied Agriculture— Farm Equipment Sales and Service” in May 1962. Starting in 1972 the latter part of the diploma read”… Agricultural Equipment Technology. Through May 1976 a total of 138 students have graduated. In recording the past and looking to the future the department has always recognized the importance of research not only to society but to our instructional and extension activities too. That is why the reader will find it woven throughout this historical episode. Research activities exist for the purpose of solving problems—this being the means by which progress is achieved. If we are to teach students, particularly those who go into graduate study, we must have available dynamic problem solving laboratories, equipment and activities. The new technologies of agriculture, carried to the farmers by the extension and industrial workers, are based in large measure on the results of research. There was a period, early in our history in which we had little or no research. We were justly criticized then by the lag or lack of research especially by those who worked directly with farmers. But not today. Once research “got going” it has performed superbly. North Carolina has always been a leader in flue-cured tobacco research and extension. This was natural since its monetary value was the highest of any agricultural product in the state and in the United States. Its quality is in demand all over the world. llege. The team at Oxford felt a need for more instrumentation. Green left in 1949 to pursue the Ph.D. at Massachusetts Institute of Technology. N. W. Weldon, Research Assistant Professor, was an early faculty member on this program. He was transferred from the Department of Agronomy and Assistant Farm Superintendent, U.S.D.A. and N.C.D.A. in 1949. He earned his B.S. at N. C. State in 1917. He had a wealth of practical experience in the total tobacco program and thus was a valuable contributor of the time. The early experiments were centered on improving the structure of conventional barns, usually a 16-foot cube, and its heating and air control system. Without question progress was a significant development. Extension bulletins were written to aid the farmer in building and operating improved equipment. Commercial interest were quite active and helpful. All in all it was a period of intense interest, debate and revolutionary fervor. One sidelight might be recounted. The high combustible temperatures and the bone-dry tobacco accruing towards the end of the cure results in many burned barns and crop losses. In an attempt to remedy this problem, one manufacturer designed and constructed aluminum additions. The first trail was on a North Carolina farm, with the press, state officials, and farmers in attendance. Since it was off season the barn was loaded with paper, rather than tobacco leaves, and ignited. The result was a fire of such intensity that it melted the complete structure. It was just on of those disappointing happenings, tragic at the time but really insignificant from a long backward look. The real technological change came when Hassler, who replaced Green, conducted somewhat uncommon theoretical investigations, the results of which caused old-timers to shake their heads. His analysis for the curing process was based on the measurements of leaf tissue temperature with imbedded thermocouples. In pursuing the chemical and physical changes taking place in a leaf during certain curing phases, a drop of hot solder fell on the leaf. The sudden application of a specific temperature had arrested the chemical changes within the leaf. This led to the determination of the dynamics of the yellow to brown color change as a function of time-temperature. These relationships provided the predictability for successfully curing leaves packed in bulk rather than the necessity of stringing on sticks. The circumvention of stick curing opened the way for mechanizing the harvesting, as well as the curing operation. Bulk curing was the name of the new concept. It involved curing the leaves packed tightly in racks supported and protected in a low profile building. It was undoubtedly one of the department’s most valuable contributions to the region’s agriculture. In the past 10 years more than 30,000 of the bulk cures were manufactured and sold in North Carolina. They handle about 50 percent of the crop today and are growing in volume yearly. Some of the commercial racks and containers today are so large that farmers find a chain hoist of hydraulic tractor lift necessary in handling them. The man-hours per acre were cut from about 200 to 70. Commercial bulk curers are shown in Figure 25 (bottom). 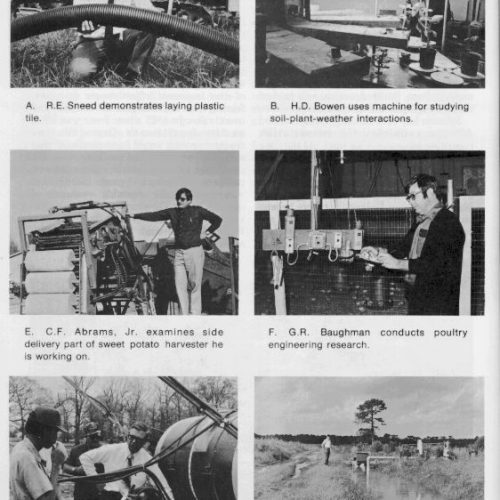 Also Figure 25 (top) shows the first experimental unit which was tried on the Stone Bros. Farm located about 10 miles south of Lumberton on U.S. 301. In line with our plan for scientific growth many graduate students worked with Hassler on the tobacco problems. Among these R. W. Watkins, W. H. Johnson, W. H. Henson, Jr. and W. F. McClure remained with the department in various positions to continue work on tobacco. Watkins is today an Extension Associate Professor working in research and extension. He earned his B.A.E. in 1958 and his industry returning in 1962 as Extension Assistant Professor. Notably, he has been engaged in on-the-farm testing of mechanical harvesters and was instrumental in developing and testing of bulk box curing (whole leaves from the harvester deposited in a large box and cured). In 1976 over 50 percent of the barns sold were of the box type contrast to suspending leaves in a rack of the type shown in Figure 25. Watkins has also given assistance abroad. He has been in Australia for a short period at their request on bulk curing problems. They are just getting underway down under with this new technology and needed expert advice. In 1961, Henson, who completed his Ph.D. as an ARS-USDA employee at North Carolina, was transferred to Kentucky to work on the problems of burley tobacco. McClure’s work on nondestructive quality measurements will be mentioned later. Today the major research work on curing is being carried on by and under the direction of W. H. Johnson, a native of North Carolina, who earned all three of his degrees here, the Ph.D. coming in 1961. Curing in the bulk was indeed revolutionary but one should see what goes on now. Its truly amazing. Johnson is experimenting with leaves precut in different sizes and packed in all kinds of containers and with precise control over the environment during every phase of the cure. Figure 37G. shows one of the many groups who were attracted to these experiments at the Oxford Station. The container on the right is being filled with the precut leaf. Who knows but what this may be the way of the future. Some of Johnson’s experiments take him to the high plant population per acre and handled more like a crop of hay. There are also the energy saving experiments, important for tomorrow’s fossil fuel shortage. Its all very exciting to say the least. Should some of us join the old timers on that fence row, and shake our heads in disbelief? I hope not—progress is at work deserving affirmative nods. As in the case of many investigations the development of bulk curing had its tangential effects. For one thing, it opened up opportunities and gave added support to mechanical harvesting work. There were some who said “one cannot mechanically harvest economically the individual leaves, selectively, as they ripen from base to top.” But, shortage of labor and other problems quietly put this “can’t be done” attitude to rest. The first Agricultural Engineer to work on the mechanization of tobacco in North Carolina was R. W. Wilson, a native of Wisconsin. He came directly here in 1948 after earning a B.S. degree in Mechanical Engineering and B.S. and M.S. degrees in Agricultural Engineering from the University of Wisconsin. When approached about the job he replied, “I know nothing about tobacco only having seen it growing in a field along the highway.” He was assured we wanted one with no preformed ideas. He successfully initiated the first work leading to selective removal of the ripe leaves mechanically and automatically. One of the devices is pointed out in Fig.23. Wilson left the department to become associated with a commercial manufacturer of tobacco production equipment. Today he is President of Powell Mfg. Co., Inc. with three plants in the Carolinas and President of Powell Agri-systems of Canada. W. E. Splinter, C. W. Suggs, E. L. Howell and R. W. Watkins continued the work. In 1976 there were about 2,500 mechanical tobacco harvesters on N. C. farms. They are now commonplace. There are at least three companies in the business. Each machine has a capacity of about 50 acres per year and has eliminated some 35 hours of back-breaking labor per acre. The background for Suggs’ picture in Figure 23 is the tobacco leaf harvester and in particular the rubber leaf strippers. Wilson and Suggs were granted a U.S. patent on the leaf removal device. It is employed on practically all commercial U.S.-manufactured harvesters today. Next came the mechanization of handing the cured leaves at the warehouse market, an essential link in achieving a smooth flow of the product and efficient handing systems. The work was cooperative with ARS-USDA and co-project leaders were A. H. Graves, ARS and R. S. Sowell, Station. The procedures and techniques are being widely adopted today. Figure 37D shows one aspect. A conveyer belt attached and operated by a fork lift, loads, transports and unloads sheet tobacco. Graves is on the back side. Graves earned his B.S. degree in Industrial Engineering from Kansas State in 1950. Other production aspects of tobacco have not been forgotten. B. K. Huang has worked on precise planting and transplanting tobacco. He came to us in 1963 after completing his Ph.D. in Agricultural Engineering at Purdue University. Prior, he had earned his M.S.A.E. at the University of Illinois in 1960. The mechanical harvesting dictated the need to produce a more uniform crop. In the energy conservation area Huang is experimenting with solar-curing. Assisting is C. G. Bowers, Jr., a Research Assistant working full time on the project. Bowers is pursuing a Ph.D. degree, having acquired his B.S. and M.S. here. J. W. Glover, Extension Associate Professor, who graduated here in 1950 with a B.S.A.E. degree has been active in improving the commercial bulk curer machinery programs and took over some of the courses voided with the retirement of J. W. Weaver, Jr. His major thrust in the last decade was on pesticide and fertilizer application, and on crop processing with emphasis on peanuts, corn and soybeans. He is shown in Figure 37I working with a modern-day sprayer. He did not join the department until 1955 spending the intervening years with industry and the U.S. Infantry. The quality of the tobacco leaf that the farmer presents to the warehouse floor for sale is an influencing element in evaluating practically all the above-described experiments. But it needs to be ascertained objectively rather that by feel and appearance. W. F. McClure, Professor, has worked extensively on the problem, searching for a quick nondestructive measure of chemical composition. McClure with a B.S. degree in Agricultural Engineering from Clemson University earned both his M.S.A.E. (1961) and Ph.D. (1966) degrees, after coming here from the Southeastern Baptist Theological Seminary in 1958. More recently he has extended his knowledge to the quality factor in agricultural commodities except peanuts. The quality of peanuts weighed in for serious attention before 1958. Dickens of USDA, whom we mentioned earlier, was the leader of a U.S. government-state cooperative project. His work resulted in four noteworthy pieces of equipment and methods of use: (1) to size and shell, without breaking, grade samples of peanuts; (2) to split and orient the kernels for inspection of internal damage; (3) to take representative samples from the arriving truck; and (4) to detect aflatoxin contaminated lots of farmer stock peanuts. The above four contributions have been singled out because they are all employed to a major degree by the peanut marketing and abroad. For example, the machine for splitting and orienting the cotyledons in order to detect internal damage rapidly has been used since 1961 for grading all farmers’ stock and shelled peanuts produced in the United States. Dickens is shown with the machine in Figure 26. Yes, this machine is used at the marketing plant, owned by Jimmy Carter, the 39th president of the United States, in Plains, Georgia. ;In 1972 Dickens was invited to Turkey and Iran as a short-term consultant on a problem of aflatoxin in pistachio nuts. Photo of J.W. Dickens USDA researcher at BAE shown with a peanut kernel splitter and orientator he developed. Aflatoxin is also becoming quite a threat to some of the agricultural products in the Southeast. In addition to peanuts, it is present today in corn and cotton seed in particular. T. B. Whitaker, an employee of ARS-USDA is stationed here to work on the problem. He graduated from the department with a B.S.A.E. (J) in 1962 and received his M.S.A.E. degree in 1964 working under Dickens on the problem of off-flavors in peanuts due to temperature. He earned a Ph.D. from Ohio State 1967 and returned to the job he now holds. We started our engineering activities attacking drainage problems and have continued work in the soil and water area. In 1945 field drainage investigations using both open ditches and tile were initiated jointly with the U.S. Soil Conversation Services at the N. C. Tidewater Research Station near Plymouth with E. G. Diseker, with a B.S. degree from Alabama, in charge. Diseker an employee of USDA was transferred here. The striking thing about this experiment was that despite the large acreage employed, the results were voided by the side effect of adjacent designs. This was really a positive find and forced a different approach; that is theoretical, using mathematics, laboratory models and computers. Starting in 1954, J. Van Schilfgaarde, Drainage Engineer, a joint employee of the State and ARS-USDA did extensive work using theoretical approach. He earned all three of his degrees from Iowa State University, joining this department after achieving the Ph.D. in Agricultural Engineering. He is credited with developing some of the first successful draw-down equations for spacing of drain tile. He also recognized the need for inter-disciplinary approach and was instrumental in having two USDA personnel, C. R. Willey, a Soil Physicist and R. E. Williamson, a Plant Physiologist, located in the department. In 1964, Van Schilfgaarde was transferred to Washington, D.C., USDA. He is now Director of the U.S. Salinity Laboratory, Riverside, California. E. H. Wiser has made a number of computer applications in hydrology. He came to us from Iowa State and earned his M.D.A.E. degree in 1959. He continued on as a faculty member. In the early 60’s he assisted Van Schilfgaarde in developing a computer simulation model for designing subsurface drainage, a concept that has found wider use. Later he used computer techniques to predict watershed runoff. Although the importance of removing excess water was recognized early, it was not until the late 40’s that plant stresses due to lack of moisture received major attention. T. V. Wilson, in cooperation with W. G. Woltz of the Soil Science Department started the first irrigation experiments with tobacco. Wilson joined the department as Assistant Professor in 1949 after earning his M.S.A.E. from Purdue University. He graduated from Clemson University with a B.S.A.E. In addition to research he also had teaching duties. The irrigation experiment was successfully concluded and Wilson accepted a position with Clemson in 1956. We are proud of the fact that in 1972 he earned his Ph.D. here. R. E. Sneed, Extension Associate Professor who earned his B.S. in 1959 and his Ph.D. in 1971 in this department has been active along with others from Soil Science in conducting field studies on irrigation of corn, cotton and peanuts. Later he expanded his activities into the use of sprinkler irrigation on fruit and vegetables crops in cooperation with Horticultural Science. He has also been active in drainage extension work. Figure 37A. shows him in front of a plastic tile laying machine at a demonstration. From 1972 to 1976 Sowell and Sneed continued to work on the efficiency of water utilization especially from the crop requirements. Two computer based models emerged—one to project water requirements and one to determine optimal use of a given quantity of water. The extension activities previously handled by Ellis were taken over by J. D. Netherton for one year starting in 1957. In 1958, he resigned to go with Oklahoma State University. Later Sneed was appointed Extension Assistant Professor to continue the irrigation work. He is well respected as evidenced by his position of technical director of the N. C. Irrigation Society. He was a short-term consultant to the Greek Tobacco Corp. who held large tobacco acreage’s in Uruguay, S. A. Needless to say, the number of acres of irrigated crops and the number of crops irrigated in N. C. have continued to increase as a result of all this work. 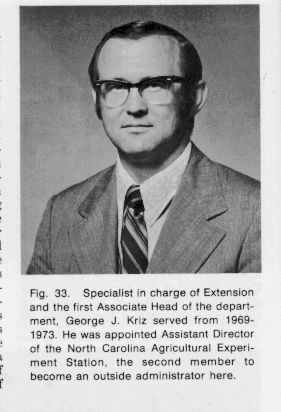 In 1965 G. J. Kriz was employed as Assistant Professor with 20 percent of his time paid by and devoted to work in the Department of Soil Science. He holds B.S.A.E. and M.S.A.E. degrees from Iowa State University and a Ph.D. degree in Water Science and Engineering from the University of California at Davis. Although teaching some classes, his major effort was on research projects involving land forming, animal waste management, and water control for farm land in Eastern North Carolina. He led the team that developed a computer program for land forming designs for surface drainage and initiated work on subirrigation and water control systems. R. W. Skaggs, Associate Professor, continued Kriz’s work in 1970, the year he came to us from Purdue University after earning a Ph.D. degree. He holds a joint appointment with the Department of Soil Science. He has been active on many projects including the University’s Water Resources Research Institute. His most significant contribution to date is the development of a computer-based water management model, which includes both surface and subsurface components along with other variables. Skaggs is shown in Figure 37J at a subirrigation project at the Tidewater Research Station. During the dry season water is pumped from a well into a canal from which it flows into the drainage lines. During the wet season the canal drains by gravity. In the early days we were concerned only with drainage. The use of the computer must be recorded as one of our significant developments. It started in the mid 50s when W. E. Splinter procured a small analog computer for use in tobacco research. Soon after Van Schilfgaarde and graduate assistant E. H. Wiser used an IBM 650 located in Patterson Hall to develop equations for spacing of drain tile. The main leadership in computer application, however, came from Wiser. In 1958 he used the IBM 650 to develop a water balanced model. This work was expanded in 1959 on a Univac 1105 at Chapel Hill to study irrigation water requirements. Graduate student, J. I. Sewell, also used the Univocal to study water flow to subsurface drains. In 1967 Wiser, along with D. A. Link and K. A. Jordan (background mentioned later) successfully promoted the first department terminal on the campus connected to an IBM 360 located in the Triangle University’s Computation Center about 20 miles from Raleigh. This was truly a “milestone.” Jordan was using the computer to study chicken growth environmental relationships, and Link to optimize machinery utilization on the farm. The terminal resulted in widespread use in the department. One can only conclude that the amount of computer usage is directly related to its accessibility and ease of use. The computer has been of unmeasurable benefit in the past 20 years, however its future may be truly revolutionary. 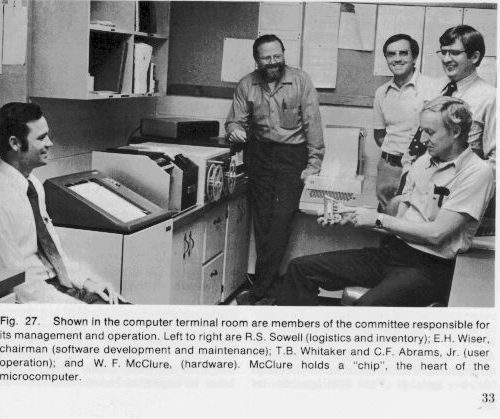 In 1975 McClure promoted the microcomputer—small and inexpensive. It will permit the processing of data at the time of collection. Bowen (background and work mentioned earlier) envisions its wide usage for such automated operations as steering a tractor. The possibilities are endless. The existing departmental committee responsible for the management and operation of the terminal consists of Wiser, Chairman, Abrams, Sowell, Whitaker. They are shown in one corner of the terminal room in Figure 27, with their major duties indicated in brackets after each name. The “chip,” heart of the microcomputer as mentioned above, is held in the hand of McClure. In 1961 Giles left the University to go with The Ford Foundation as consultant on an agricultural program in India. F. J. Hassler was chosen as his replacement and has remained so to date. He was a logical choice having pioneered the department’s work into the world of truly scientific endeavors, as excellent as any other scientific discipline. The number of employees (faculty and staff) included the federal persons increased from 32 in 1961 to 71 in 1975. Giles and Hassler, the second and third department heads are shown in Figures 28 and 29. We can be justly proud that seven from among our faculty, have been appointed Department Heads: D. S. Weaver, Giles and Hassler at North Carolina; Parker at Kentucky; Splinter at Nebraska; Scarborough at Delaware; and I. L. Williams at Texas Tech., Lubbock. Some of our graduates are in administrative positions. J. H. Anderson, Master of Science in Agricultural Engineering in 1954, is Director of the Agricultural Experiment Station at Mississippi State University. A. W. Snell, Head of the Department at Clemson, S.C., took a leave and earned his Doctorate here. J. I. Sewell who earned his M.S. and Ph.D. here is Assistant Dean of the Tennessee Agricultural Experiment Station. Funds in the amount of $475,500, for an additional 24,000 square feet of office and research laboratories, were obtained in 1967. This section was completed in 1969. It was a two-story structure which filled in the courtyard of the new building and contained the necessary foundation and structure to support a third floor. Again the farm leadership outside of the University recognized the need for physical facilities and strived hard to meet it. For that fourth appropriation, a farm machinery manufacturer and State Senator J. J. Harrington of Lewiston N. C. was very instrumental. 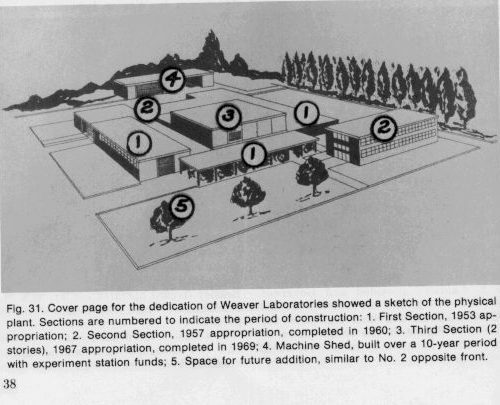 The total plant was dedicated as Weaver Laboratories on October 15, 1970 with Senator Harrington making the principal address. Chancellor J. T. Caldwell presided and Governor R. W. Scott dignified the occasion with his presence. These and other dignitaries are shown in Figure 30. The cover page for the dedication program is shown in Figure 31. The rendering of the completed structures which appears on the cover was made by Mrs. D. B. Dosher of whom we spoke earlier. Numbers are superimposed on the various units of her drawing to indicate their order of construction and are identified in the inscription in Figure 31. Still unfulfilled is the need for an addition similar to the front office section No.2 to go in spot No. 5, and a third story on No. 3. Number 4 is a storage building that was constructed piece-meal with Station funds. The total floor area in Weaver Laboratories now contains about 95,000 square feet (machine shed exempted). As the department matured, the need to give simultaneous attention to all operations of a system became increasingly clear. One simple example is the work by Humphies on harvesting cucumbers narrated later under Fruit and Vegetable Engineering. It clearly indicated the need for an improved bed if it was to succeed. 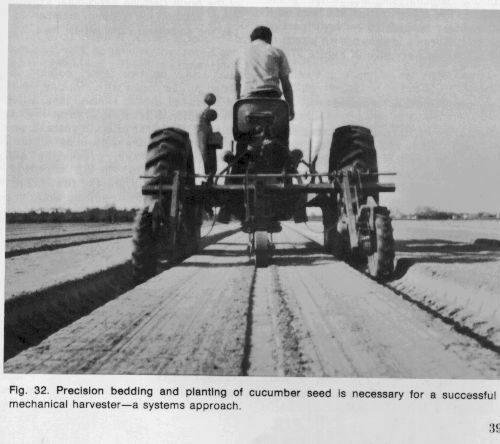 Figure 32 shows the result—a precision wide flat bed and planting. This is a far cry from the rather rough and peaked bed constructed in the early years usually with a mouldboard plow. This new seed bed and related operations has been carried out by Beasley (record narrated earlier) as a research and extension demonstration project. Nowhere in the department’s activities has the computer and mathematical modeling been more effective than when used for evaluating and managing our expanding agricultural systems approach—both for research and farm production. The number of variables and their interactions in agriculture are becoming so complex today that it is beyond the capacity of the human mind when working with the tools of yesteryears; the slide rule calculator and field trials. The department was one of the first in the United States to recognize the need for and the potential of the systems approach in research. In 1962 D. A. Link was employed for his expertise in the methodology of the systems approach and computer technology. He came to us after receiving a Ph.D. degree from Iowa State University. From this early commitment there has been widespread growth both here and elsewhere. In 1970, Link joined the Department of Computer Science on the campus as Associate Professor and Administrative Assistant. He passed away in 1976. R. S. Sowell, Associate Professor, earned his Ph.D. degree here in 1967 under Link. After 4 years in the Air Force, he joined the department in 1970 to work on Systems Engineering. His efforts were focused on the production and marketing of tobacco and horticultural crops. Also, Sowell and Sneed worked together on mathematical modeling to optimize the use of water for agriculture. Sneed acquired the data and Sowell did the modeling plus teaching. Another example is recent research in the production and processing of peanuts. This work is being conducted by J. H. Young, a young scientist who joined the department after earning his Ph.D. degree from Oklahoma State University in 1966. Young earned his B.S. (1962) and M.S. 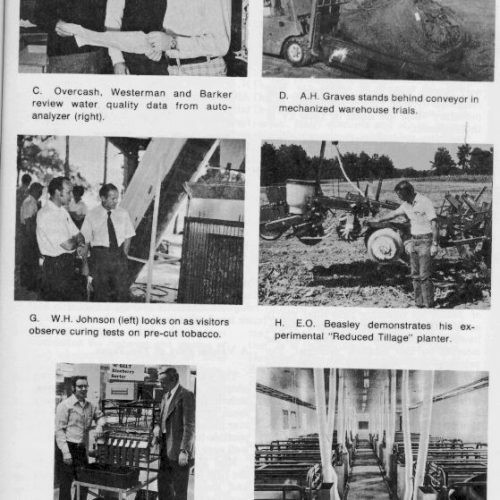 (1964) in Agricultural Engineering from the University of Kentucky. He is using a modeling approach to optimize the production system. For example, plant growth is simulated in its reaction to such factors as temperature and moisture. Concurrently, the same approach is used for optimizing the harvesting and curing system. Eventually these two systems will be linked into one. It is interesting to note that this approach of today is possible because of the mass of field and experimental data collected in the past. Young is also doing some teaching of courses in processing for both the science and technology students. We have long recognized that sooner or later fruits and vegetables, particularly the harvesting aspects must be given attention. Other than sweet potato vine harvesting back in the 40s practically nothing was done until the early 60s. Since then substantial work has been on the blueberry, cucumber and sweet potato production, harvesting and processing systems. R. P. Rohrbach who earned his Ph.D. in Agricultural Engineering at Ohio State University joined the department in 1968 as Assistant Professor to do research in blueberry mechanization, and teaching. He is in the process of developing techniques for harvesting the ripe blueberries for the plant. Progress has been made to the point of a field operated model with a fairly high degree of performance. Also progress is being made in processing and packaging the blueberries. Included are fruit cleaning, drying and maturity separation. Most exciting is an experimental machine called “M-Belt” Maturity Sorter. It is shown in Figure 37K along with Rohrbach and McClure. We mentioned some of McClure’s work on tobacco earlier. On this machine, McClure covered the electronic aspects and Rohrbach the mechanical. E.G. Humphries, with a B.S., M.S. and Ph.D. from the department has been concentrating on the mechanical harvesting of cucumbers. He initiated and has sustained the multipick approach. The basic technology for producing the crop along with the mechanical hardware for the actual harvest has been successfully demonstrated. The latest version is shown in Figure 19 in the research shop being readied for the 1977 season. Humphries is standing beside the machine. Much work, of course, remains but there is little question of the outcome. It is only what and when. It wasn’t until 1972 that full attention was given to the sweet potato problem. Prior to that, Humphries worked on harvesting until J. R. Hammerle was hired in 1968. Hammerle had just completed requirements for the Ph.D. from Pennsylvania State University following an assignment in Indonesia. When he resigned in 1971, Humphries took over again. In 1972 C. F. Abrams, Jr. was hired from the University of Kentucky. A native of N. C., he earned all three of his degrees (B.S., M.S., Ph.D.) here. His initial approach was to investigate harvesting concepts, coupled with bulk-handing methods in the field and at the packing facilities aimed at reducing labor and damage to the product. The concentration has been on a side delivery articulated conveyor part of the unit. Abrams is shown with a part of the latest test harvester in Figure 37E. Actually, we have been writing about this from time to time but always in connection with a field crop, corn for example, but nothing on animal, human and greenhouse structures. Of course the extension faculty, right from the start, have always been concerned with the engineering of all farm structures. Blueprints and specifications were a part of their stock-in-trade so to speak. (See Figure 6.) And that service was and still is as good as any in the nation. Later we began to approach the problem from the environmental aspects. R. M. Ritchie, Jr., an able Extension Specialist in Farm Structures, did considerable work in this area both from an extension and applied research approach. He came to us in 1948 from the Southern States Cooperative in Richmond, Virginia. He had a B.S.A.E. from Virginia Polytechnic Institute (1942). Blue ribbons from ASAE on two report papers: Insulated Broiler House Plans, attest to his ability. Ritchie resigned in 1996 as Associate Professor after 18 years of service, to do consulting work in agricultural production, storage, processing and marketing facilities. To our knowledge Ritchie and Coats are the first faculty members to go into consulting work on a full time basis. The area of service is one of growth for our profession. W. C. Warrick, another Extension Specialist, has been concerned with rural housing. He graduated from the department in 1941 with a BSAE, and immediately went into military service. He joined the faculty in 1945 where he remained until retirement except for a short period as an earth moving contractor. In 1970 he was transferred to Extension Home Economics in charge of Housing and Home Furnishing section, but maintained his professional rank in the department. He was a nationally recognized authority on rural housing. A cover page of one of Warrick’s leaflets, giving the details of a completed home remodeling demonstration in Alexander County, is shown in Figure 8A. For teaching and research in Structures and environment, our first full-time faculty member was B. F. Parker who had earned his Ph.D. in Agricultural Engineering from Michigan State. He started investigative work on the effects of environment on hens. This approach towards finding what the animal needs and then designing the structure to provide those needs was indeed pioneering for that time. Parker left in 1956 to join the Agricultural Engineering Department at the University of Kentucky, later becoming Head of that department. The position vacated by Parker was filled by Assistant Professor K. A. Jordan who had just complied his Ph.D. in Agricultural Engineering at Purdue University. He also earned his B.S.A.E. and M.S.A.E. at Purdue. Jordan extended the previous work to involve the use of computer modeling, which we mentioned earlier. He resigned in 1967 to go with the University of Minnesota as Professor. Today poultry research is being carried out by G. R. Baughman, an Associate Professor. He also teaches a course in Structures and Environment. He joined the department after earning a Ph.D. in Agricultural Engineering from Ohio State University in 1971. His research involves the use of large, several thousand bird, structures. Figure 37F shows Baughman inside one of his experimental units with some of the instruments. Poultry Engineering best describes the efforts to improve energy efficiency, environment and mechanical handling of broilers. Mechanical ventilation, cleaners, insulated houses and controlled lighting are very much a part of today’s management practices. But producing and marketing more broilers per unit building at less feed consumption still remains a great challenge. Since 1966 attention has been directed to improving swine production through engineering. Environmental control and management practices have produced results. For example, air conditioning a breeding facility at the Upper Coastal Plain Research Station has proved effective and economical. Figure 37L shows the interior of a swine farrowing house on the Exum Scott farm near Wilson, N. C. which serves both as a research and demonstration unit. During the hot season air conditioned air is fed down the vertical tubes to the individual pens. L. B. Driggers, Extension Professor, is responsible for this area of work. A native of South Carolina, he earned his B.S.A.E. ;at Clemson University and M.S.D.A. from Virginia Polytechnic Institute and State University where he was on the extension faculty for nine years. He came here from that position in 1966. Willits came here after receiving his M.S. and Ph.D. degrees in Agricultural Engineering at the University of Kentucky. He earned his B.S.M.E. from the University of Florida. He is devoted about 85 percent of his time to the greenhouse problem and the remainder to teaching agricultural processing. In addition to immediately attacking the cost of producing greenhouse crops largely through energy efficiency. Willits and Sowell in cooperation with the Department of Horticulture are looking further down the road. They are developing mathematical models that will eventually provide the information to optimize the entire system and its management. Since humans are involved in one way or another in agricultural operations, human engineering has been part of many research projects. One faculty member, Suggs, however, has directed specific attention to the influence of various environmental factors on the response of the human. For example, the influence of vibration and noise on the operator. Huang is associated with this work as a co-leader. Within the first 60 some years two faculty members have advanced to administrative positions above the departmental level. The first was D. S. Weaver whose records were narrated earlier. Ellis retired in 1969 after 34 years of continuous service. The extension faculty under his leadership had grown from two to eight. Above all else he helped to integrate smoothly the extension faculty and staff into the department in 1961 when Hassler was named Head. Today, in effect there is only one faculty. For example, Sneed and Glover have both extension and teaching responsibilities, and Watkins, Beasley and Driggers are budgeted for some research. The integration of the extension faculty into the department was very significant in that it improved the effectiveness of transforming new technologies to the end-user. 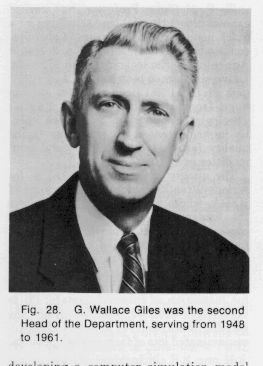 In September 1969, Kriz was selected as Ellis’ replacement with the title of Associate Head In Charge of Extension for the Department. This was a new position, indication of a growing department. In 1973 he was appointed Assistant Director of Research of the North Carolina Agricultural Experiment Station, School of Agriculture and Life Sciences. The addition of Life Science to the school’s name was made in 1964. Kriz’s portrait is shown in Figure 33. 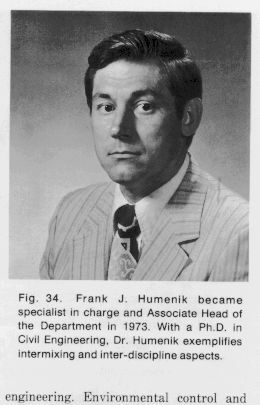 Kriz was replaced in 1973 by F. J. Humenik who came to the department as Assistant Professor with teaching and research responsibilities. He had a B.S. in Civil Engineering, an M.S. in Sanitary Engineering and a Ph.D. in Civil Engineering, all from Ohio State University. Humenik’s portrait appears in Figure 34. Prior to his advancement as Associate Professor and Associate Head In-Charge of Extension in the department he carried out research in waste management in connection with animal production. This project set an example for the nation in the land application of farm wastes. Russel Train, Administrator of EPA in Washington, D.C. visited the first two demonstration units that Humenik was influential in helping to start, one for a 300 sow unit and one for a 250,000 per week hatchery. The devoted basic principles have been applied to broader applications such as slaughter houses and poultry processing, and even small municipalities. It is another example of carrying research, theoretical in the beginning, to the applied stage. Sneed, mentioned earlier, also helped with the two demonstration units. M. R. Overcash, Associate Professor, with a Ph.D. in Chemical Engineering from Minnesota in 1972 replaced Humenik on the waste problems of agriculture. In 1975 Assistant Professor P. W. Westerman was added to the faculty to work on the project. He came to us from Kentucky having earned a B.S., M.S. and Ph.D. in Agricultural; Engineering there. Three main areas are being studied: (1) the treatment of animal waste so that it can be recycled on the farm, (2) the effect of industrial wastes on agricultural land and (3) the pollution of streams from sources of runoff from agricultural lands. The solutions to these problems are vital in today’s society. The department now has a full-time Extension Specialists working in the waste management areas. He is J. C. Barker who earned all three degrees in Agricultural Engineering from the University of Tennessee and did some postdoctoral work at Georgia. He joined here in 1974 as Extension Assistant Professor. He appears in Figure 37C, along with Overcash and Westerman and an autoanalyzer (right) for water quality. The instrument cost something like $35,000 in 1974 and gives four simultaneous measurements. Throughout our history in keeping with the change from animal-powered and labor-intensive farming and teaching of “how and what” of mechanical things and operations associated therewith has been a significant part of our total program. In this connection we have been a part of two notable endeavours: (1) the Southern Association for Agricultural Engineering and Vocational Agricultural (later American Association for Agricultural Engineering and Vocational Agriculture); and (2) “The 4-H Tractor Project” sponsored by some of the major oil companies. We were one of the twelve southern states that started and financed the S.A.A.E. and V.A. organization in 1945. This association produced engineering technology publications for use mainly by high school teachers of vocational agriculture. Giles and Fore have served terms as president and both have rewritten some outdated publications. From the original 12 states that organization now encompasses all 50 and accordingly carries a name that so indicates. The tractor project continues on and has been a proud activity of the extension engineers. Ferguson, Glover and Beasley have been particularly active. Safety, particularly in operation is always important. Research-wise the work of Suggs during the 60s and referred to earlier on environment-human relationships will have a beneficial impact. Today it is receiving greater emphasis from Extension. In 1975 J.P. Schultz joined the department as visiting Extension Assistant Professor to work on farm safety and the U.S. government’s “Emergency Preparedness” program as well. Previously he was in Massachusetts doing the same type of work. He had earned a B.S. in agricultural economics (1950) from that institution. He also received a Masters of Education from N.C. State University in 1974. Throughout our history we have longed for effective means of identifying the superior on-campus teachers, and extension educators. In 1965-66 came the “Academy of Teachers” for on-campus faculty. Members are outstanding classroom teachers selected yearly by a committee in each school. Once selected they are members for three years and eligible again after two years. Proudly the department has had three “Outstanding Teachers”, G. B. Blum, Jr. in 1968-69, and again in 1975-76; E. L. Howell in 1971-72; R. G. Holmes in 1973-74. This is quite commendable when one considers that the number selected each year have varied from 12 to 32 from a total university faculty of around 700. Appropriately an “Outstanding Extension Service Award” was started in 1972-73. Each year six in the School of Agriculture are selected by a committee from among department head recommendations and approved by the Vice-Chancellor for Extension and Public Service, and the Chancellor. Only a total of 10 are awarded annually. In 1974, L. B. Driggers was a recipient. Earlier we mentioned Driggers’ work not only in extension but also in research. The aforementioned teaching and extension faculty members, with the exception of Holmes, are shown as a group in Figure 35. Holmes joined the department in 1967 as Assistant Professor and resigned in 1974 to accept a position with Ohio State University. He earned all three degrees in Agricultural Engineering from Ohio State and came to us from industry. In addition to his outstanding teaching abilities he was involved in some research, particularly strawberry mechanization and agricultural waste utilization. Blum also has administrative qualities. In September 1969, he was appointed “Undergraduate Teaching Coordinator” responsible to the Head. In 1976-77 school year, he was elected to the University’s Faculty Senate. In today’s world no discipline has completely fulfilled its responsibilities to society without extending its expertise to the development countries. The department made its mark in this area with more than five years of assistance, starting around 1964, to the Indian Institute of Technology at Kharagpur, India to strengthen its post graduate training and research. The project was supported by The Ford Foundation and was directed by Hassler. Additional participating faculty were: Bowen, Mammerle, Johnson, Kriz, Link, McClure, Splinter, Suggs, Willey and Wiser. At the termination of the grant in 1972, an independent review team cited four worthy characteristics: (1) reliance on short term “2 to 3 months” and top flight advisors; (2) degrees awarded by and at IIT; (3) thesis research at IIT, and (4) no substative involvement of USA colleagues in the affairs an polices of IIT. These ideas most of which we believe were original in 1964 are becoming increasingly accepted and used by other institutions in their foreign help programs. Most significant was No. 1. Because the term was short the department was able to spare almost any faculty member that IIT requested. No other arrangement would have made this possible. Another indication of extending a helping hand is in the number of our foreign Ph.D. graduates, 15 out of a total of 64. These have come from India, Iran, South Africa, China, and Taiwan. Greene was given 6 months leave of absence to assist with the training of Indian Extension Agricultural Engineers on the program Giles was associated with. Also, he spent 6 months assisting with the development of shop facilities and management in Peru, South America, as a part of the University’s AID project there. Johnson has been called to European and African countries for consultation regarding tobacco curing work. At the time he was experimenting with freeze-dried smoking tobacco. Professor Huang is a native of Taiwan and earned his B.S. degree from the National Taiwan University where he was on the staff for several years. His advanced degrees and work here were recounted earlier. He is now a citizen of this country. Also we mentioned earlier Dickens work in Iran. Back in the 40s there were state boundaries to be crossed, today it is countries and continents— worldwide. We have written in some detail about the growth in the depth and credibility of the department’s work, of which we are proud. But there is another equally important aspect—“expansiveness.” In reading these pages one can’t help being impressed with the growing number of programs and of the improved effectiveness in transferring new technologies to students and users alike. In 1945 when Teter was hired as the department’s first full time researcher who would have predicted that someday we would be working with the problems of say waste management, pumping water back through the tile that was installed for draining wetlands of eastern North Carolina, or helping a University in India develop its programs. Figure 37A through Photo L shows this expansiveness more forcefully than words. Up to 1977 the department has graduated 547 Bachelor’s degrees, 88 Master’s and 64 Ph.D.’s 138 students have completed the 2 years terminal program. The total graduates at end of the spring exercises in 1976 was 837. The roster of graduates by years and program is presented in Table III in the Appendix. Scholarship, not numbers, has always been and will continue to be our fundamental goal. To attract and encourage students of excellence, five special fund awards have been available since 1959. The first selection committee was composed of Garner, Sewell and Blum, Chairman. The recipients by year, type of scholarship and monetary value are listed in Table IV in the Appendix. The Tobacco Mechanization Scholarship was given by Tobacco Associates for one year only. The Surtman Foundation Scholarship was established by J. R. Surtman of Carolina Ford Co. of Charlotte and continued until the business was terminated in 1967. The D. S. Weaver Scholarship, named after the former head, derives its funds from patent royalties on the finger wheel rake (Figure 21). The ASAE Endowed Scholarship is of growing significance.It was initiated jointly by the department and the N. C. Section of ASAE by soliciting individuals yearly contributions from its members .Today, however, the dollar awards come from the interest on the invested principal. The principal now amounting to more than $30,000 was secured through a campaign that covered North Carolina and included industry and outside interests. Of all the active workers on this drive, which is continuing, Glover has been exceedingly successful. We are particularly proud of the Cole Scholarship because it honors two of North Carolina’s most productive citizens.The late E. M. Cole and E. A. Cole of the Cole manufacturing Co. of Charlotte, invented and manufactured the world’s widely used inclined plate seed-metering planter. E. M. Cole was the inventor and E. A. Cole the business manager. The daughter of E. A., Mrs. Jean Cole Hatcher, past President and presently Chairman of the Board, started the award in 1959. Her son, John Cole, a graduate of the N. C. State University is now President. The names of the recipients are engraved on a handsome plaque which hangs in the foyer of Weaver Laboratories. The plaque also includes an insignia in relief that uniquely models the inclined seed metering plate. One can find this kind of planter in practically every country of the world—for example the author has seen it in operation on a one-row machine, pulled by a pair of bullocks in far away India. 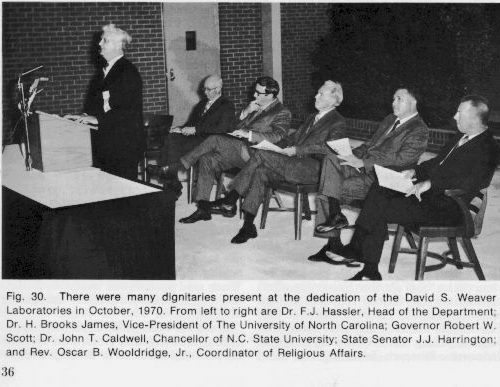 In line with the goal of scholarship, the N. C. Mu Chapter of Alpha Epsilon, ASAE’s honor society, was formally established in 1967, largely through the efforts of Coats and Suggs.The charter members were C. F. Abrams, Jr., C. G. Bowers, Jr., A. C. DeBeer, C. R. Camp, Jr., J.P. Robbins, D. L. Roberts, R. S. Sowell, L. F. Stikeleather, L. M. Sykes, D. H. Vaughn, and C. W. Suggs, Faculty Advisor. Membership is based on scholarship, leadership and character. It is open to both undergraduate and graduate students enrolled in curricula leading to a B.S., M.S. or Ph.D. degree in Biological and Agricultural Engineering. This “Mu” Chapter has many activities including the development of a departmental library, and to honor the sophomore with the highest scholastic average attained in his or her freshman year. The less recognized contributions to our progress are the mechanics, secretaries, technicians and draftsmen.They are very much appreciated persons.How could we ever get along without all of them? It is impossible to credit each who have served so well over a span of 60 some years. Miss Madge Hudgins was secretary to the first head, D. S. Weaver.The teaching and research faculty were so small however that Madge did it all. Mrs. Hattie Smith was secretary to the extension faculty. Miss Susan Stoker replaced Mrs. Smith for the Extension faculty in 1952 and retired in 1975. 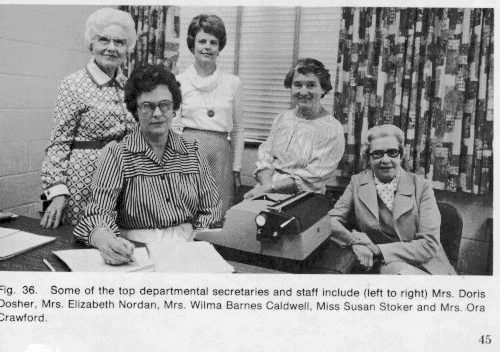 Four of these secretaries along with Mrs. Dosher are shown in Figure 36.Mrs. Dosher who retired in 1974 as supervisor of Drafting and Blueprinting was mentioned earlier.Many students and gained valuable experience under her guidance over the years. Included in later years were L. T. Woodlief, K. A. Brown, E. E. Braswell and G. G. Powell also completed a course at the Holding Technical Institute. Mrs. Dosher’s position was abolished upon her retirement. Brown carried on for a few years as Draftsman. Today the responsibility for this service is by Woodlief, Technician, and Powell, Draftsman.